Another project converting Arduino input into MIDI output. Like the one before, this project applies a loose definition of the term 'music'. 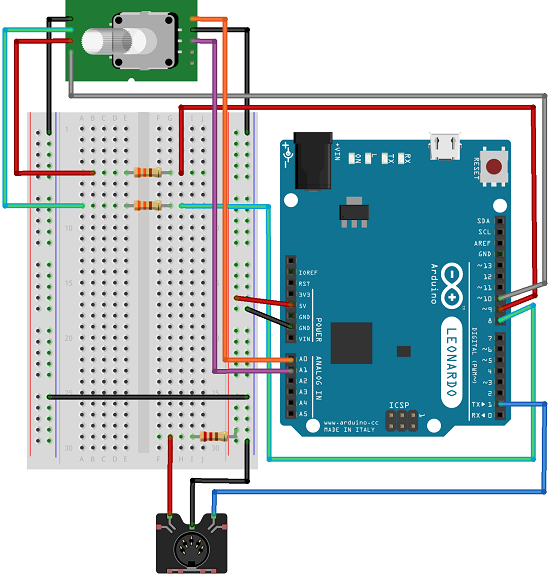 In this project, a rotary encoder is used as the input device. The LED connections for the rotary encoder are shown in the diagram but not used in the sketch. An array of 16 notes is defined at the start of the sketch. Turning the encoder changes the note that is playing. Choice of instrument makes a little difference to how bad this sounds. Clearly, the rotary encoder is not the best input device for note selection. This project seems to demonstrate that. However, the rotary encoder would be a good component to use for pitch bending. If you were using VMPK to play the notes, you will see the pitch bender tool and can drag left and right with the mouse to bend the note down or up. The rotary encoder would do this job very well if the note selection was taken care of with something sensible like some buttons.